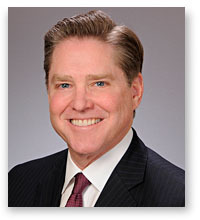 Born and raised in Loma Linda, California, Larry Osborn is a partner with Baker, Keener & Nahra. Larry maintains a diverse litigation practice that includes trust and estate disputes, commercial and business litigation, professional liability, product liability and construction defect cases. In addition to his litigation practice, he also handles transactional matters involving trusts and estate formation, the formation and dissolution of business entities, commercial contracts and purchase and sale agreements. His tireless work on behalf of his clients in both litigation and transactional matters and the calm confidence with which he handles each of his cases is reflected by his Preeminent AV rating with Martindale Hubbell. Larry is a member of the California Receiver’s Forum, reflecting his knowledge and experience as a licensed real estate broker in addition to his work as an attorney. When not practicing law or spending time with his family, Larry can be found gigging around town as the drummer for Santa Clarita’s premier rock band, Drop Zone.